Within the Austrian Development Cooperation-funded INTERDEV 2 project, responding to the potentials of the area for value-added production and income generation for socioeconomically vulnerable members of the community, the Municipality of Viti/Vitina, the Austrian Development Agency, and UNDP have ceremonially opened 13 new selling kiosks in the centre of Viti/Vitina. These selling kiosks will serve as social enterprise selling points in support to income generation for women associations and smallholder producers in the municipality, merging economic and social objectives. Most of the abovementioned groups engaged in collection, processing, and manufacturing of local gastronomic and artisanal products sell sporadically their products from one fair to another, not allowing for liquidity and stable sources of incomes from their work. In light of the high unemployment rates, inactivity rates, and labour market and business barriers, in particular among women, the project creates the opportunity for local producers to promote their own products, have a year-round selling space and to and earn more income. At the event, held amid the “diaspora days” of the Municipality of Viti/Vitina, local producers showcased their products, giving the guests an opportunity to see and purchase the diverse agricultural and handicrafts items. 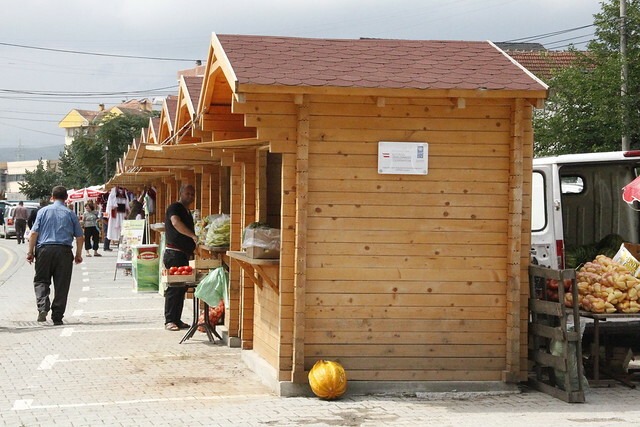 Since 2014, the Austrian Development Cooperation-funded INTERDEV project has supported residents in the municipalities of Dragash/Dragaš, Shtërpcë/Štrpce as well as Viti/Vitina in its second phase to develop new skills, find jobs, increase agricultural production, and generate more financial income for local communities. The project actively promotes empowerment of women, youth, and people at risk of being left behind with opportunities for employment, development of skills, and rural entrepreneurship.